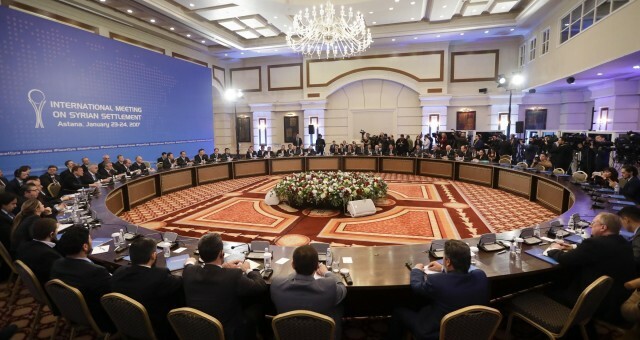 The Syrian government could not hide its disappointment for the failure to establish four de-escalation zones during the Astana talks between Russia, Turkey and Iran. Turkish authorities have been concerned about armed Kurdish groups fighting in the Syrian war. Observers think that establishing de-escalation zones could provide a safe-haven for such groups that Ankara has categorized as offshoots of the Kurdistan Workers’ Party (PKK). Earlier this week, Defense Minister Fikri Isik warned that Turkish forces would respond in kind to the “slightest fire” into Turkish territory from areas under Kurdish control in neighboring Syria. The de-escalation zones are part of a process that is expected to be expanded to other areas with the hope of imposing a ceasefire ahead of peace talks to end the six-year old war, which has left more than 100,000 people dead and forced millions to flee their homes. Meanwhile, Russia and the United States, major world powers active in the Syrian war and offering their support to Damascus and rebel groups respectively, could have their scope of cooperation widened and strengthened. According to Russian Duma’s International Affairs Committee Chairman Leonid Slutsky, they are willing to discuss imposing no-fly zones in Syria with the aim of fighting extremist groups and not President Assad’s regime. The matter could be discussed between Presidents Putin and Trump as they are expected to have a meeting on the sidelines of the G-20 Summit in Poland these days. Written by: Peter Mulvany on July 6, 2017. Posted by Peter Mulvany on Jul 6 2017. Filed under Headlines, World News. You can follow any responses to this entry through the RSS 2.0. Both comments and pings are currently closed.